Several free or low cost locations are available on the Oregon Coast. Please visit the “Yachats Wedding Locations” page for ideas, or check out locations along the coast at “Beautiful Oregon Coast Wedding Locations.” Feel free to contact me with questions for arranging your special ceremony. 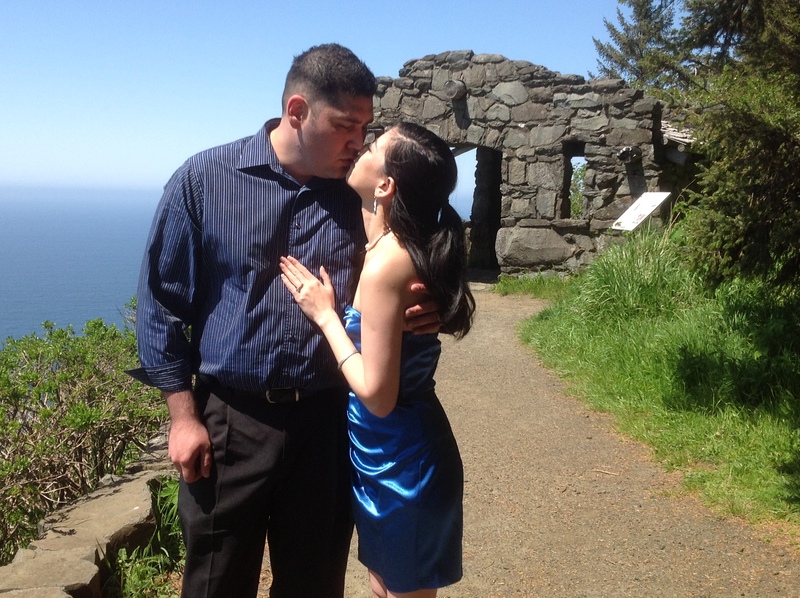 Ceremonies at the Cape Perpetua stone shelter. Custom Elopement is a small, intimate ceremony that you design with my help. It has all the unique details of a full wedding, but you choose the size and location of your event to fit your budget. I send you a questionnaire to help describe your vision for your special event. Personal vows, rings exchanges, poems, and other details may be added to this ceremony. Bring as many witness as you like (limited to 10 at Cape Perpetua). If you need witness, I can provide them. The same sliding scale applies: $150-$300 in the Yachats area. Ceremony inside the Cape Perpetua shelter. This is not a personalized ceremony, just your names. If you would like to add personal vows, please switch to the Custom Elopement #1. You bring two witnesses, and up to two more guests, teens and older. If you have more than four attending or need me to provide witnesses, you qualify for the Custom Elopement #1. If you can afford a professional photographer, please select the “Custom Ceremony” choice. Wh en scheduling your ceremony, please state in your first contact which elopement arrangement you are making, Custom or Elopement Special. Hello! I was delighted to find you on the Internet while searching for a simple but meaningful way to have my wife and I’s vows renewed this summer. It would just be the 2 of us. Our True anniversary is July 24th. We were thinking Saturday July 20th this summer. Is that day available? At Cape Perpetua? I assume such a small union would only be the $75? Would love to perform your vow renewal on July 20th. Feel free to call me or send a private email. Do you perform weddings in Seaside, OR? I didn’t mean to send my last comment without the rest of my info. We are planning a very small wedding on July 9th in Seaside. Do you perform weddings in that area? Yes, I travel all over Oregon for performing ceremonies. My home base is in Yachats on the Central Oregon Coast. For traveling beyond a 20 minute distance, I request additional funds to cover fuel and time. There is more information on my website. By any chance can you marry us this weekend, we just want the basics, on the beach in my beautiful wedding dress??? We have a wedding date set and it’s pretty close, but the stress of family friends and arrangements is making us both crazy!! Haha so we are traveling to the coast this weekend and have been talking about Just eloping!!! Hi Christina….I have a little time on Saturday morning. Does that work for you? Feel free to call me…. (541) 547-5123.
hello, would you preform a ceremony in front of haystack rock? Haystack Rock in Cannon Beach is a beautiful location for a memorable ceremony. It is about a three hour drive one-way for me, where it is much closer to Portland. We can talk about my additional fees for time and fuel for this additional distance. Hi I am iterested in knowing your rates. My boyfriend and I have been together for 11 years and would like to make it official at the coast. We are not having a wedding and would like to share this between the two of us. What would the rate be and where is the best place to get married in Cannon Beach on the ocean. Congratulations on your elopement plans! Cannon Beach is a 3-4 hour drive one way for me, depending on the time of year. Portland is closer to Cannon Beach than Yachats where I live.